We are scientists and business people, mostly working in Saskatoon. In late May 2018, we joined together to promote using our microbes to restore and maintain the health of land ravaged by chemical contamination. Our technical expertise includes fungal microbiology, molecular biology, and health science (Susan Kaminskyj, Mike Cavanaugh), environmental and soil science (Tim Repas), pharmacy and chemistry (Zakia Boubakir). Susan’s interest in organisms that survive and thrive in extreme environments began in her teens. Her research on beneficial plant-associated fungi began as a member of a field survey in the Canadian High Arctic in 2004 on Axel Heiburg and Ellesmere Islands. See the map on this page. Before forming GreenSTEM, Tim and Susan had already had years of experience in the Canadian North. Many of our projects use synergistic treatment combinations. In December 2018 we joined with Dirty Dirt, Eko Grid, EnviroHazmat, Oil Out, Roy Northern, Signum Consulting, and Zen Earth to form the Eco Remediation Alliance. It is essential to ‘think globally’ as well as ‘acting locally’. Uneven access to resources hurts billions of people. One of our major motivations at GreenSTEM is to reduce and repair the collateral damage to land and water that human technology has produced over time. We hope this will result in increased resilience in the face of global climate change. 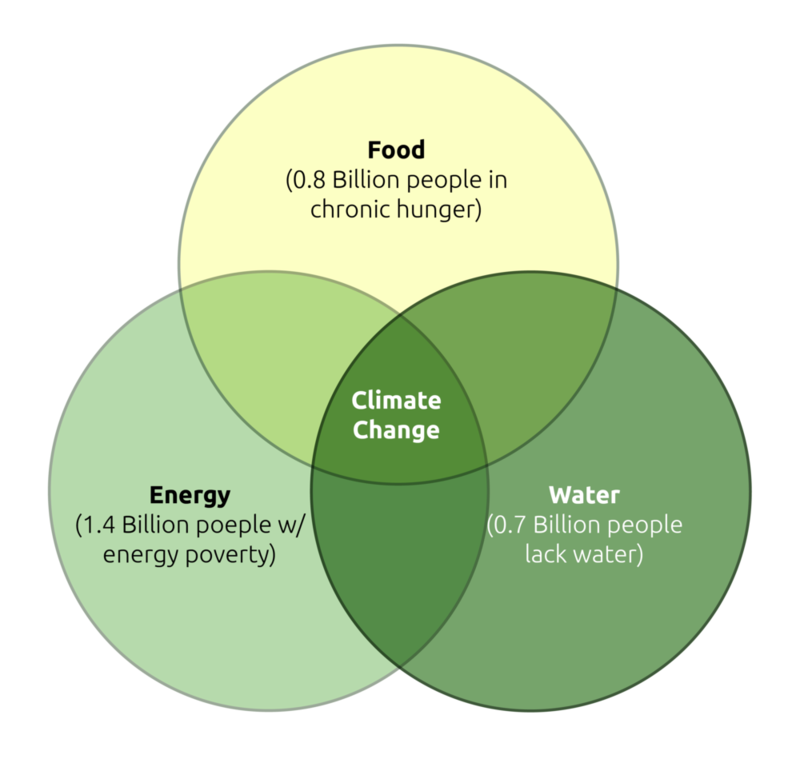 People who lack enough food, water, and energy are particularly at risk. Our methods and our motivations are grounded in our education (bioscience, health science, environmental science, chemistry), our experience (business, medicine, academia), and in our families (children and grandchildren). We feel compelled, both morally and ethically, to leave the best possible world for future generations. This image is the global transportation system, segmented by mode. Urban transport (yellow) includes walking, biking, and vehicles. Road transport (green) uses cars, trucks, trains, draught animals. Shipping and air transport (blue) are powered by fossil fuels. In 2011, 2.8 billion passengers travelled on 23.6 million flights. About 500,000 people were airborne at any time. To counteract the damage produced over millennia by humans and our technology. This includes degradation of agricultural soil, particularly by toxic chemicals. To reduce the environmental impact of exploration, transport, storage, and use of liquid fuel. This includes our current and pending bioremediation strategies. To remediate and restore marginal land. This includes bioremediation, biofertilization, and salt tolerance for farmers whose fields are dry, irrigated, or close to sea-level. To contribute to educating and employing people who will live in the world already made, and in the world we hope to create. We have an outreach program for education and jobs. We intend to develop ways to remediate as many types of contaminant as possible. Six months after incorporating, we have already developed powerful new techniques. What makes GreenSTEM’s methods powerful and our company unique? We use science- and engineering-based methods and method-development. STEM is ‘Science, Technology, Engineering, Mathematics’. We can decontaminate subsoil and beneath infrastructure that must remain in use. Other companies lack this tremendous technical advantage. Research for Hire. Many companies that specialize in fuel or chemical production cannot afford the luxury of modern, well-equipped laboratory space and highly trained and skilled research staff. We form partnerships with some client companies so that we can develop microbe strains that specifically target their needs. We are a Canadian Clean-Biotech startup based in Saskatoon SK and Fort St John BC. Our current projects span BC to New Brunswick, and Vancouver Island to the North West Territories. We are working with CHEP Good Food to remediate a brownfield (chronic, low level contamination from leaking fuel storage tanks) on the west side of Saskatoon. The askîy (Cree word meaning earth) Urban Agriculture Internship Program promotes environmental sustainability for Indigenous and non-indigenous youth. Currently they have to use container-gardening because of soil contamination. (https://www.chep.org/program/askiy-project-urban-ag/). We will be working with Allison Squires and Cody Straza, who have an organic farm in south central Saskatchewan, close to Grasslands National Park. As well as dryness, some of their soil has salt deposits. Already, salinity reduces productivity of at least 10 % of agricultural land world-wide. We will hire and train summer students to help with this work. Salinity reduces plant growth and yield on about 10 % of agricultural land. High salinity effects are notable in areas that are close to sea level or are irrigated. High concentrations can be cytotoxic. Unlike fuels, salinity cannot be metabolically converted into safe compounds. These are images from 1984 [left] and 2011 [right] of strip mining activity in the Athabasca oil sands, about 50 km north of Fort McMurray Alberta. Natural extreme environments including deserts are unexpectedly common, about 30 % of the world’s land area. Deserts are natural extreme environments. Deserts have low biodiversity ecosystems (they are depauperate) because few species can tolerate their physical and chemical extremes. Deserts also have low biomass ecosystems in part because of their scant food resources. About 15,000 km2 of southern Saskatchewan is semi-arid prairie, that gets up to 50 mm annual rainfall. Once named Palliser’s triangle after the man who mapped this area, it had been judged too dry for crops. Natural deserts in Saskatchewan include the Great Sand Hills and Athabasca Sand Dunes. This map shows the the position of the major oil sand deposits in Canada, which mostly are in Alberta. Anthropogenic (made by humans) extreme environments are increasing in abundance. These include land contaminated with liquid fuels, with synthetic chemicals (also called xenobiotics), and with combinations of these. In the USA seriously contaminated sites are now managed by the ‘Superfund’ program. The Athabasca oil sands are another type of anthropogenic extreme environment. These have been mined since the mid 1960s and now have a footprint of at least 1000 km2. Remediating anthropogenic extreme environments was a prime motivator for forming GreenSTEM Technology. Both the world’s land area and its human population are predominantly northern. Even though half of the population lives between 27°N and 27°S, the other half lives at higher latitudes. Industrialized societies living at high latitude need to use more fuel due to cold and darkness. 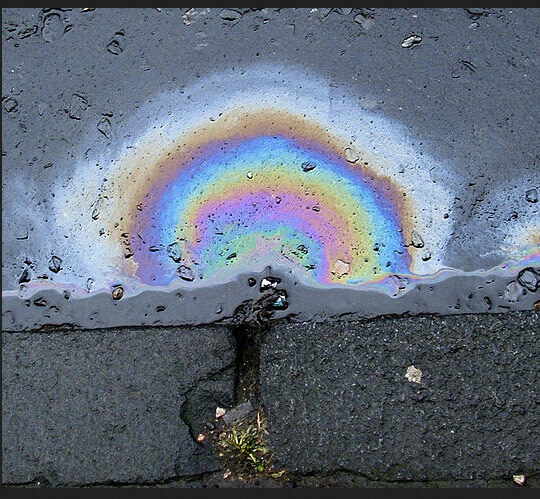 Fuel transport and use inevitably leads to spills and leaks that damage local environments. Functionally, Northern latitudes are ‘cold deserts’ because they have low biodiversity, low biomass, and low nutrient levels, as well as low average temperature. The high latitudes are difficult to remediate because on average, metabolism slows by half when temperature goes down by 10 °C. GreenSTEM’s microbes were found in in the north, and we have had good success using them to treat spills. Here, a small oil seep spreading across water. The coloured rings are due to thinning of the seep as it spreads. Note the small green plant growing at bottom. Most likely it is symbiotic with an endophyte that confers oil tolerance. What does GreenSTEM do when bioremediating a spill? The site is analyzed to plan an optimal remediation strategy. Chemicals can migrate through subsoil, so mapping older sites is essential. GreenSTEM microbes are native, non GMO, and biosafe. If needed we add one or more bio-compatible treatments from allied remediation companies. These combinations are synergistic. None of our treatments is toxic. They are compatible with organic and vegan products, as well as with growing plants on sites we have remediated. As well as using existing strains, we isolate and develop new microbe strains to decontaminate new types of chemical. This is ‘Research for Hire’, which is unique to GreenSTEM. To test our progress in a remediation project, we use nationally accredited, commercial, third party analytical labs to document our results. What kinds of microbe do we use? We use many types, including members of all the major groups: Bacteria, Archaea, Fungi, Algae, and Protista. Notably, GreenSTEM microbes are biosafe, both for us to grow and use them, and for our customers after application. We grow our strains in controlled laboratory conditions before we use them to treat contaminated sites. Our microbes are rare in nature because they are not competitive against other strains. We have developed proprietary methods to isolate and identify the strains we need. In part, this is why contaminated sites do not remediate spontaneously, even if fertilized. Why do we use microbes? Many microbes live in ‘extreme’ environments such as rock, ocean depths, clouds, ice, and volcanic vents. Microbes are abundant (as many as a trillion per gram of soil) and there are millions of species. Our screening methods are designed to select and enrich rare microbe strains for our specific needs. Many contaminants are produced by chemical synthesis (these also called xenobiotics, not found in nature) so degradation enzyme pathways for them are rare. Xenobiotics include pesticides and plastics. Microbe strains that degrade xenobiotics are rare in part because the chemical structures of xenobiotics are unlike compounds produced by organisms. Our microbes grow quickly under controlled conditions, so we can prepare the numbers we need. We have optimized application methods so we can deploy them wherever needed. The collateral effects of human populations are substantial, and cumulative over time. Generally, collateral effects increase as technology becomes more sophisticated. In the past 10,000 years (early crop farming) our technology has led to population growth and longevity, but also to increasing dependence on non-renewable fuel resources. Worldwide, current annual human energy use exceeds solar input by ~25%. The ‘extra’ comes from burning ‘fossil fuels’ that were produced by plants and algae that lived many millions of years ago. Each step of extracting, refining, transporting, storing, and using fuels inevitably leads to spills and leaks. Their effects are cumulative and poisonous. Many countries already have lower food-security and water-security. A trio of Peace Country parks will be splitting $1 million for upgrades and improvements.